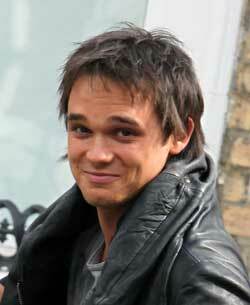 Gareth Gates was born in Bradford and attended Dixons City Academy in West Bowling, where he studied art and music at GCSE level. He became head chorister at Bradford Cathedral when he was 11 years old, singing for the Queen at the age of 13. He was runner-up to Will Young in the first ever Pop Idol in 2002, and has since had three number one singles (Unchained Melody, Anyone of us, The Long And Winding Road and sold 3.5 million records in the UK alone. His debut album, What My Heart Wants to Say achieved first week sales of 100,000 copies, peaking at number two in the UK Albums Chart and eventually earning double platinum status. In 2008 Gates starred in the line-up for A Spoonful of Stiles & Drewe which was a charity fundraiser to celebrate 25 years of musical theatre composers George Stiles & Anthony Drewe. In 2009 he confirmed that he had no plans to go back to the pop music scene and was planning to concentrate on musical theatre, taking over the role of Joseph (of Technicolor Dreamcoat fame) from Lee Mead. Over the past 18 months Gareth has appeared on ITV1’s Dancing on Ice (finishing in fourth place), participated in the Dancing on Ice UK tour; starred as Prince Charming in Cinderella at Wimbledon Theatre, played Joseph in the West End production of Joseph and the Amazing Technicolor Dreamcoat and in November 2009 took on the role of Marius in the year-long 25th Anniversary Tour of Les Misérables. He has just reprised his role Marius in the London production of Les Miserables at the Queen's Theatre and played Aladdin at Milton Keynes Theatre over Christmas. Earlier this year he appeared in a one off concert Momentous Musicals at the New Wimbledon Theatre in July and has been starring in new British musical Loserville with Aaron Sidwell, and Lil' Chris at the Leeds Quarry Theatre. He has just finished a tour of Legally Blonde the Musicalplaying Warner. He starred in the pantomime Sleeping Beauty at the Marlowe Theatre in Canterbury over Christmas and has just finished a country wide tour of Boogie Nights the Concert in which he co-starred in with the Osmonds.